Ms. Stacy Cummings serves as the Program Executive Officer for the Program Executive Office Defense Healthcare Management Systems. 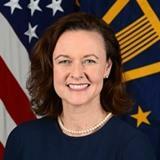 As Program Executive Officer, Ms. Cummings oversees the Department of Defense electronic health record modernization including the operational, data exchange, and interoperability initiatives. Specifically, she provides direction to the following program offices: the DoD Healthcare Management System Modernization, the Defense Medical Information Exchange, the Joint Operational Medicine Information Systems, and the Department of Defense/Department of Veterans Affairs Interagency Program Office. Ms. Cummings previously held senior executive positions at two operating administrations within the Department of Transportation where she established strategic direction, provided executive leadership and managed daily operations. Additionally, Ms. Cummings served as the Department’s executive sponsor for the Joining Forces initiative to connect service members, veterans, and their families with career opportunities in transportation. Beginning her career as an Acquisition Logistics Intern at the Naval Air Systems Command, Ms. Cummings spent 17 years with the Department of the Navy where she gained expertise in logistics, maintenance support and information technology acquisition and deployment. She held senior positions with the Naval Air Technical Data and Engineering Services Command; Commander, Fleet Readiness Centers; Program Executive Office for Command, Control, Communications, Computers and Intelligence; and the Space and Naval Warfare Systems Command. She brings significant experience leading people, managing complex organizations, and overseeing multi-billion dollar financial operations. Ms. Cummings received her Bachelor of Science in Business Logistics from The Pennsylvania State University and holds a Master of Science in National Resource Strategy from the Industrial College of the Armed Forces as well as a Master of Science in Management/Information Systems from the Florida Institute of Technology. Certified in both Program Management and Acquisition Logistics, Ms. Cummings is a graduate of the Naval Air Systems Command’s Senior Executive Management Development Program and the Defense Senior Leader Development Program. Check out the incredible speaker line-up to see who will be joining Stacy.